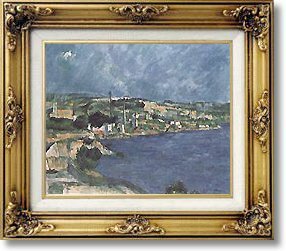 Saint Henri et La Baie de L'Estaque by Cézanne - no-risk guarantee! "After fifty years of the most radical change in art from images to free abstraction, Cézanne's painting, which looks old-fashioned today in its attachment to nature, maintains itself fresh and stimulating to young painters of our time." (Meyer Schapiro, from the book "Modern Art".) This is one of the most beautiful of several of his artworks of the coastline around L'Estaque.